. I have never had this before but I have heard good things about Founders. It is a chilly damp rainy night in early November and this may be just what I need. The beer pours a clear dark brown with amber hues and a modest but fairly rich off white to tan head. The rich aromas from this beer are noticed immediately from the pour. The nose is wonderful with rich dark malts and notes of chocolate and dark fruits. With a gentle swirl nice floral hop aromas are also released. Man this smells too good to be and Scotch Ale I can’t wait to see what it tastes like. Wow, this is too good to be a Scotch Ale. This beer has the most interesting rich malt flavors for a Scotch Ale. It’s more like a robust English Porter but with a very refreshing aspect to it. Boy I’m going to have a hard time giving this one a play by play. 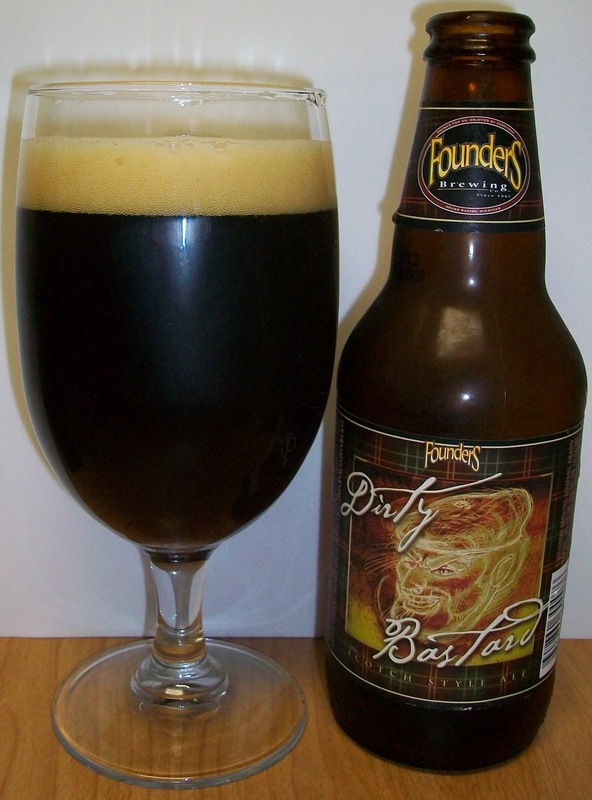 The taste starts off with dark sweet malts up front then a pleasantly smooth mid-sip. There is a malt robustness that builds throughout the middle of the sip. The back-end is very easy drinking for such a rich malt beer. The malt flavors intensify towards the end of the swallow into the finish but these flavors at no time turn bitter or unpleasant just more robust. The finish is fairly dry with a nice malt and hop bitterness. The final aftertaste is a lingering dark roasted malt flavor with an almost creamy stout like coating throughout your mouth. This was a very unexpected experience for a Scotch Ale. I expected malt flavors but nothing like this; Very Impressive. I’m going to let this set a bit and warm up. I’m curious as to how it will open up with the increase in temperature. We are now at 58 degrees. Oh my, this is good, really good. The rich dark roasted malt flavors are smoother and better then ever. I am really impressed with this beer. I wanted to let this get to room temperature but it’s too good to let it sit and warm up, it’s gone. I’m not sure if a beer can be too malty for a Scotch Ale/Wee Heavy but this is so good I don’t really care. I’m giving this an A. No matter what you call it this is one excellently crafted beer. Smooth rich dark malts with a very complex hop and malt finish. This is one of those well crafted beers with the complexity so that you will pick up something different with each experience.